S-MileSmart platform to integrate different freight transport means, manage and Foster first and last mile in supply chains. Development of a set of tools for supporting first/last mile logistic multi-modal transport, fostering green transport means and solutions. A novel routing algorithm, vehicle assignment optimization algorithm and freight transport cost calculating module. A decision support tool to allow freighters to choose the optimal route of the freight, including the first/last mile transport by comparing the results generated taking into account several parameters such as time, distance, environmental and social impact, cost, etc. in order to identify the best solutions. The S-mile Market Tool enables the integration of multimodal transport of freight for transport companies without direct access to the receiver (first/last mile). Moreover, it could be used by citizens to find the first/last freighter and send or retrieve information from them. The S-mile Freighter Tool will allow freighters to determine optimal routes, provide driving directions and real-time tips to foster eco-driving, monitor the location of the fleet and transmit data between vehicles and the company dispatcher. The S-mile Transport Planner Tool which will allow the others tools to: issue multiple shipments in one path (both deliveries and collections), update the route taking into consideration the road condition and new collections and finally, be able to optimize the route according to the traditional (length, time or cost) or innovative criteria (social or environmental impact). The S-mile Fleet Management Tool which will enable freighters the generation of reports in order to calculate total costs of freight transport according to those parameters from the S-mile Freighter Tool (among others all unit costs related to realization of transport including personal unit cost, unit fuel consumption and other operating cost, etc.) which take into account freighters’ needs or preferences (e.g. maximum load capacity, approximate transport time, monetary cost, etc.) and routes found by the S-mile Transport Planner Tool. The S-mile Visualizer Tool will allow freighters and local authorities to monitor the road conditions (distribution of traffic and emission, state of the pavement, etc.) and get information about the overall freight transport. 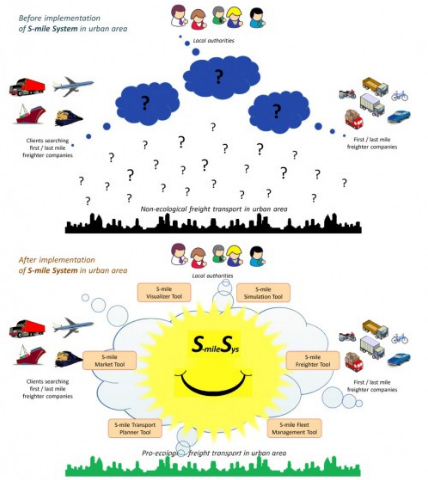 The S-mile Simulation Tool which will allow public authorities/environment consultancies to holistically assess the impact that different actions like incentive/taxation systems, modification of schedules, parking spaces, etc. will have over the economic, social and environmental performance of the freight transport. The products developed will be tested in two case studies including real data about the road conditions and hubs location. Flagship Call 2015. Sustainable Logistics and Supply Chains.